Potent auto strain with a short flowering cycle and large harvests. One of the most popular feminized strains is now available in autoflowering seeds form. Train Wreck Auto comprises of 60% Sativa, 30% Indica and 10% Ruderalis genes, generating a stable and uniform female plant. Compact, dense buds produce a high quality harvest, with all the ease you expect from an autoflowering strain. Like all autoflowering marijuana seeds, Train Wreck Auto requires no set hours of darkness to produce its buds. Able to grow both indoors and outside, the seeds require approximately eight weeks to simultaneously flower and mature ready to harvest. Train Wreck marijuana is well known for its powerful effects and dense, flavorsome buds, with this autoflowering variety having similar characteristics. The plants are easy to grow, producing dense buds with a peppery citrus flavor and subtle aroma. A favorite with many medical marijuana users, and loved by recreational users alike, Train Wreck autoflowering seeds have a THC content of approximately 16%, with a 0.49% CBD level. Great for pain relief, as well as relieving stress and tension at the end of the day. Yields can vary depending on conditions, with outdoor growers producing an average of 150 grams per plant when grown over the optimum Summer months. Indoor growers should provide their plants with as many light hours as possible, and can expect harvests of up to 250 grams of top quality buds per square meter. Train Wreck autoflowering seeds are a perfect choice regardless of your level of experience. Planted outdoors at the beginning of the season, these marijuana plants will quickly grow, flower and mature, producing dense, potent buds in approximately eight weeks. Requiring very little work or experience, you can grow your own Train Wreck marijuana in a fraction of the time and cost. 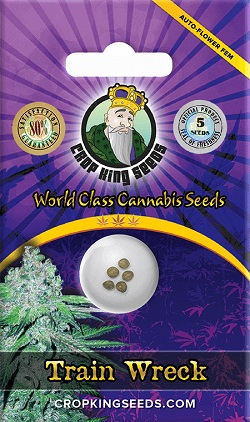 Choose from 5, 10 or twenty feminized autoflowering seeds per pack. Buy Train Wreck Autoflowering Seeds today and receive fast discreet shipping to Canada and all US states.